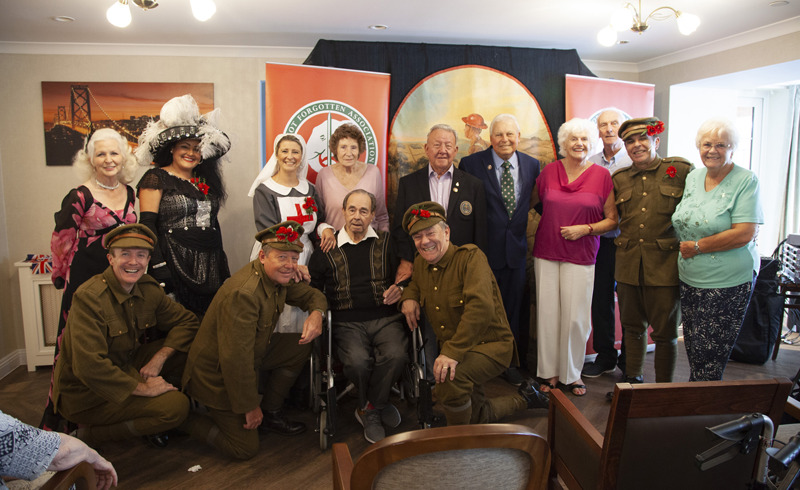 A group of professional entertainers put on a performance on behalf of the Not Forgotten Association for a Fairmile Grange care home resident, in recognition of him raising over £50,000 for serving personnel and veterans who are wounded, injured, or living with a disability or illness. On Tuesday, September 18 Mickie Driver staged a performance at the Christchurch care home, with other professional entertainers from The Not Forgotten Association, to thank resident Roy King for the support he has provided over the years. At the age of 18 Roy joined the RAF as an aircraft electrician in Transport Command in Abingdon, where he stayed until he was 23. A few years later in 1979, Roy moved to Bournemouth and joined the Royal British Legion in 2000. Following this, in 2006 Roy became a fundraiser for The Not Forgotten Association, which is supported by the Royal British Legion and a range of other causes. During Roy’s time at the Royal British Legion Club, Roy was in charge of organising the entertainment and was introduced to professional entertainer, Mickie. Recognising Mickie’s talent, Roy provided opportunities for Mickie to perform at the Royal British Legion, whenever possible. Mickie, who is also a fundraiser of The Not Forgotten Association, regularly stages performances for the charity, with his group of professional entertainers. As well as supporting Mickie, Roy and a small group of his friends also raised over £50,000 for the charity. This was subsequently acknowledged by The Not Forgotten Association and the Christchurch Borough Council, who presented Roy and his friends with a certificate, in recognition of their outstanding achievement. Andrea Davey, wellbeing assistant of Fairmile Grange, said: “We were delighted to welcome Mickie and his talented team of performers into Fairmile Grange. Two years ago Mickie performed at Windsor Castle, where he helped celebrate the Queen’s 90thbirthday, so it was a privilege to watch him and the other entertainers perform for us.